The AT-RPS3000 Chassis is a modular power supply system for the x610 Series of Layer 3 Gigabit Ethernet switches. It protects the switches from power supply failures and provides additional PoE+ power. 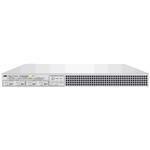 The chassis can support two or four x610 Series switches, depending on the switch model. It has two slots for power supply modules, an LED panel for viewing the status of the power modules, and four RPS connectors.